The University of Chicago Medicine Comprehensive Cancer Center is a collaborative cancer research center based in Hyde Park, Chicago, United States. The Comprehensive Cancer Center is affiliated with the University of Chicago. The Comprehensive Cancer Center was founded in 1973 as the University of Chicago Cancer Research Center, and, after earning its Comprehensive Cancer Center designation, was renamed the University of Chicago Medicine Comprehensive Cancer Center. The Comprehensive Cancer Center is one of 45 comprehensive cancer centers in the United States as designated by the National Cancer Institute of the National Institutes of Health. In 2010, U.S. News & World Report once again gave the UChicago cancer program high marks, ranking it #15 in the nation. The first cancer research center director was John Ultmann whose specialty was the diagnosis, staging and treatment of Hodgkin's disease and non-Hodgkin's lymphoma, and the development of cancer chemotherapy. The director is Michelle Le Beau who accepted the position in 2004. Le Beau launched and implemented a strategic plan that helped the Comprehensive Cancer Center expand the scope of its research programs, and to launch a comprehensive community engagement program to enhance public awareness about cancer prevention, detection, treatment, and the role of genetics in cancer risk. Le Beau's work has been in therapy-related cancers. Research lab at The University of Chicago's Knapp Center for Biomedical Discovery. The Comprehensive Cancer Center is involved in more than 300 cancer clinical trials[when?] and encourages participation in the clinical trials by community oncologists and minority populations through a network of affiliated hospitals. Researchers also strive to eliminate health disparities among ethnic and social groups that compose areas surrounding the UChicago campus. 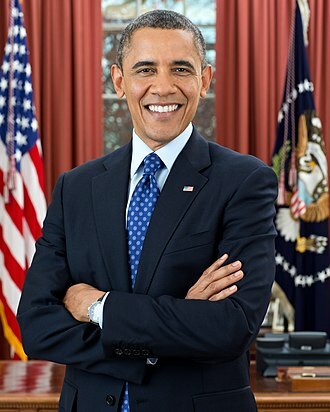 UChicago accomplishments include landmark prostate cancer treatment in 1939, the identification of the first chromosomal abnormality in leukemia in 1972, the 1988 discovery of the molecular mechanism by which tamoxifen blocks the effects of estrogen, and the 2008 development of a new MRI procedure that can detect early breast cancer. ^ "Archived copy". Archived from the original on 2010-05-27. Retrieved 2010-06-18. 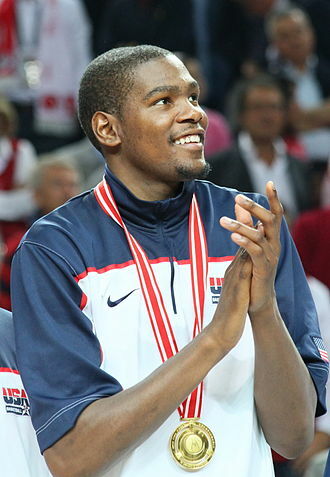 The Orthogenic School specializes in the treatment of youth who have failed in other treatment settings. The school is located on the campus of and is affiliated with the University of Chicago, the school is able to adequately educate students of above-average intelligence and assist students in pursuing advanced courses on an individual or group basis. Students may attend universities or private and public schools on a part-time basis. Currently, the school is able to treat students in a setting without utilizing seclusion or medical restraint. Dorm counselors and teaching assistants typically have a bachelors degree, while at school the students have contact with a staff of therapists, program managers, special education teachers, art teachers, teaching assistants, and other professionals. Students with appropriate privileges have the opportunity of going out into the community several days a week, the school has developed a comprehensive transition program for adolescent students leaving for home, college, or independent living. Students in the Transitional Living Center have the support of the staff, their old dorm staff. They are typically able to go into the community and pursue employment, educational options, students stay in the transitional program for periods ranging from several months to two years. 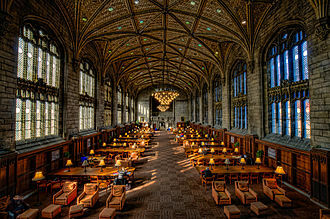 The school is affiliated with the University of Chicago and is located on the campus, because of this, students are able to utilize many campus facilities during the day. The school has several programs, including a student work program, student government, a local Junior Achievement charter, a literary magazine. Students can participate in as many activities as they like, so long as their behavior. Students attend periodic family sessions with their program manager or individual therapist, the dorm counselors regularly contact parents and update them on their childs progress, and students are able to call home at least once a week and can write as often as they wish. Students who are not able to go due to distance or behavior may visit their parents at the school or in the local community. 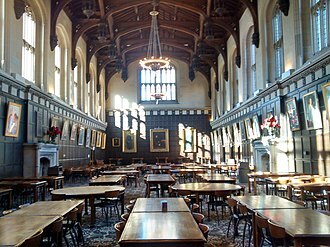 The Quadrangle Club is the name of a membership club at the University of Chicago. It is located at 1155 East 57th Street in Chicago and it has a full-service dining room, a bar, several lounges, and sleeping quarters for members and/or their guests. It has 17 sleeping rooms, including 5 suites with a sitting room. It is one of the few locations in the city of Chicago that has Har-Tru tennis courts, the Quadrangle Club was created in 1893 as a social club for the faculty of the newly established University of Chicago. It was to be a place to gather for study and especially communication and it was spearheaded by Robert Francis Harper, an associate professor of Near Eastern Languages and the younger brother of William Rainey Harper, first president of the university. It originally occupied a suite in the Barry Hotel, located at 59th Street between Dorchester and Blackstone. By 1895, the club had outgrown the hotel suite, and land was purchased for the construction of a house on the southeast corner of 58th and University. The new club opened in 1896 and contained billiard and card rooms, a gymnasium, some sleeping rooms. Outside, to the south, there were tennis courts, the Club hosted many social events, including lectures and dances. As an afterthought, a dining room and basement kitchen were added to the building. In 1897, fires led to modifications of the building by Howard Van Doren Shaw, in 1916, to make way for Rockefeller Chapel, the Quadrangle Club agreed to relocate to a parcel of land on the corner of 57th Street and University Avenue, the present site. Howard Van Doren Shaw designed the new building, which opened on December 21,1922, Shaw designed a building resembling an English country house, with large open spaces and—on the second floor, facing the tennis courts—abundant natural light. In the summer of 1929, the old house was moved two blocks west to 956–960 East 58th Street, where it was renamed Ingleside Hall. The Quadrangle Club enjoyed a golden age during the 1920s and 1930s when it functioned as a gentlemans club offering billiards, a card room. Seminary Cooperative Bookstores, Inc. founded in 1961, is a cooperative bookstore with three branches in Chicago. Its flagship, known colloquially as the Seminary Co-op or simply the Sem Co-op, is located at 5751 S. Woodlawn Avenue, the Seminary Cooperative Bookstores sell shares of stock for $10 each, a purchase of three shares constitutes a membership, which provides a 10% discount. 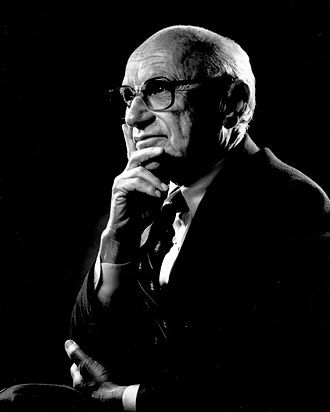 Profits are typically reinvested into the Co-ops reserve funds, as distribution of profits would be negligible, the Co-ops reputation was so great that Columbia University invited manager Jack Cella to either open a branch in New York City or leave and open a new store there. Until the university gained its own neighborhood academic bookstore in the late 1990s, the Co-op has over 53,000 members,3,500 of whom are located overseas. The following countries have at least 100 members, the United Kingdom, Canada, the following countries have at least 50 members, Spain, the Netherlands, Israel, Hong Kong, France and Korea. The Midway Plaisance, known locally as the Midway, is a Chicago public park on the South Side of Chicago, Illinois. It is one mile long by 220 yards wide and extends along 59th and 60th streets, joining Washington Park at its east end and Jackson Park at its west end. It divides the Hyde Park community area to the north from the Woodlawn community area to the south,6 miles south of the downtown Loop, near Lake Michigan. 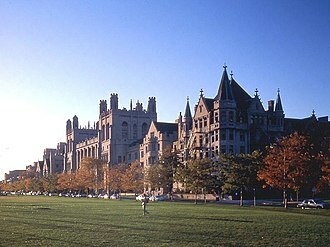 Today, the Midway runs through the portion of the University of Chicago campus, with university. It early came to prominence when it hosted amusements at the Worlds Columbian Exposition in 1893, lending the name Midway to areas at county, the Midway is landscaped with a fosse or dry ditch where the canal would have been. Later designers and artists added their vision to the Midway, a pet project of the University of Chicago and almost a part of its campus, it has remained essentially a green area. The area was a lakefront marsh ecosystem, the firm of Olmsted, and Co. famous for creating New York Citys Central Park, was hired to design the urban oasis. 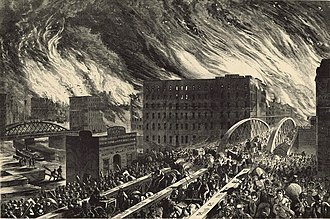 The South Park Commission office, where all the plans were stored, was burned in the Great Chicago Fire of 1871. 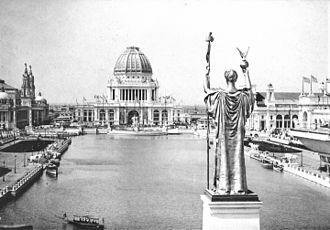 The expense of rebuilding the city eliminated the funds to cover expenditures that the plans would have entailed, the Worlds Columbian Exposition of 1893 was held in the underdeveloped parts of the South Park. The worldwide celebration of Columbus transfer of the torch of civilization to the New World in 1492 was one of the most successful and it covered over 600 acres and attracted exhibitors and visitors from all over the world. George Washington Gale Ferris Jr. s original Ferris Wheel carried over 1.5 million passengers, the Midways money-making concessions and sideshows made over $4 million in 1893 dollars, and it was the more memorable portion of the Exposition for many visitors. In the years after the Exposition closed, midway came to be used in the United States to signify the area for amusements at a county or state fair, the Midway Plaisance represented Africans as cannibals and other races as inferior and primitive. It is the largest national laboratory by size and scope in the Midwest. UChicago Argonne, LLC, the operator of the laboratory, brings together the expertise of the University of Chicago with Jacobs Engineering Group Inc, Argonne is a part of the expanding Illinois Technology and Research Corridor. Argonne formerly ran a facility called Argonne National Laboratory-West in Idaho next to the Idaho National Engineering. In 2005, the two Idaho-based laboratories merged to become the Idaho National Laboratory, Argonne has five main areas of focus. Argonne began in 1942 as the Metallurgical Laboratory at the University of Chicago, the Met Lab built Chicago Pile-1, the worlds first nuclear reactor, under the stands of a University of Chicago sports stadium. Considered unsafe, in 1943, CP-1 was reconstructed as CP-2, the lab was named after the surrounding Argonne Forest, which in turn was named after the Forest of Argonne in France where U. S. troops fought in World War I. Fermis pile was originally going to be constructed in the Argonne forest, and construction plans were set in motion, since speed was paramount, the project was moved to the squash court under Stagg Field, the football field on the campus of the University of Chicago. Fermi told them that he was sure of his calculations, which said that it would not lead to a runaway reaction, other activities were added to Argonne over the next five years. On July 1,1946, the Metallurgical Laboratory was formally re-chartered as Argonne National Laboratory for cooperative research in nucleonics, at the request of the U. S. Atomic Energy Commission, it began developing nuclear reactors for the peaceful nuclear energy program. A complete list of the designed and, in most cases and operated by Argonne can be viewed in the. Such alluring secrecy drew visitors both authorized—including King Leopold III of Belgium and Queen Frederica of Greece—and unauthorized, shortly past 1 a. m. on February 6,1951, Argonne guards discovered reporter Paul Harvey near the 10-foot perimeter fence, his coat tangled in the barbed wire. 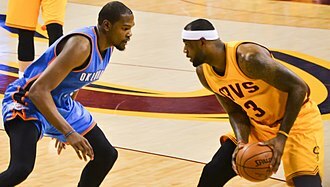 Searching his car, guards found a previously prepared four-page broadcast detailing the saga of his entrance into a classified hot zone. He was brought before a grand jury on charges of conspiracy to obtain information on national security and transmit it to the public. Front view of the Rockefeller Chapel. 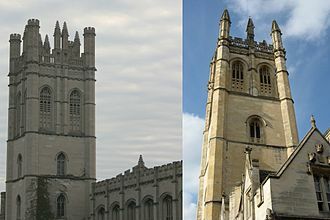 The carillon tower of the Rockefeller Chapel.